Stepping out of your comfort zone is not only about trying new things that scare you, but also equipping yourself with the tools to make new and exciting decisions. I am a big proponent of sharing knowledge to help others jump out of their fishbowls [when they are ready]. Are you interested in starting your own business? Overwhelmed with where to start? 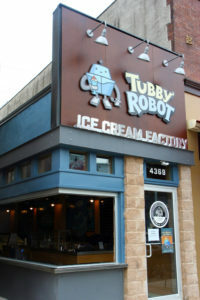 I conversed with Chris Maguire, owner of Tubby Robot, a recently opened ice cream parlor located in Philadelphia’s Manayunk section, and he gave us a nice overview of how that process looks. Hi, Chris, how are you? I’m doing great! I mean, I’m tired and nervous and scatterbrained, but great! Tell us a little about yourself, what did you study in school? How did you get to becoming a business owner? I became an incorrigible gamer sometime during the first grade. After a long and particularly awkward adolescence, I hoped to pursue an education in video game development so I could transition into being a particularly awkward working adult. In 1999 there weren’t many schools that catered to this proclivity, so I opted to cobble my own curriculum together at an interdisciplinary program. I took classes in computer programming, fine art, and animation. On the side, I experimentally poked at the inner workings of the Internet and made a series of weird personal websites because I thought it was fun. Entrepreneurship fell into my lap when a classmate asked me to help write code for a design client of his. Suddenly I was getting paid for practicing what I considered to be a neat little hobby, and that revelation blossomed into a fruitful career as a web developer. Though I am eternally grateful for that career and the opportunities it has afforded me, I sort of got sick of staring at computers all day and decided I wanted to start a new business in something more tangible. I know you used to go to ice cream festivals pretty regularly, would you say you love ice cream? In a divided and often turbulent world, ice cream is the one pure and good thing we can always count on. My favorite flavor tends to change based on whatever I’ve been making most recently, but traditionally I’ve been partial to mint chocolate chip. Wow, so you are opening up an ice cream parlor! what spawned that idea? I’ve loved ice cream my entire life, and I started making my own shortly after receiving an ice cream maker as a wedding gift. Our first batch came out rather underwhelming – it was too icy, poorly flavored, and generally speaking – an utter abomination. Not being satisfied with failure, I stubbornly iterated for months until I was making something I was proud to share with others. Years later, I found myself living in a wonderful neighborhood (Manayunk) with a desire to open a brick and mortar business nearby. At that point, building an ice cream parlor was the only option that made sense. Once we secured a location, I began working with an architect to figure out the best way to renovate the space. During the planning and permitting process, I churned out hundreds of batches of ice cream at home to perfect my technique. How does it work with food? Do you have to get approved by the FDA? There is a long process one must go through to open a food establishment that weaves through Licenses and Inspections, the health department, dairy licensors, and food safety certifications. It was all new to me, so calling it a “learning process” would be an understatement. Fortunately our inspections have all gone through without issue, and if I had to do it all again I could probably complete it in a quarter of the time. Do you make the ice cream in-house? Yes! 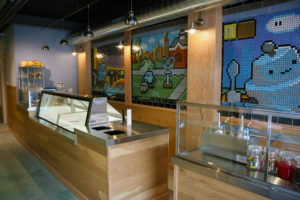 All of our ice cream is made within the scant 600 square feet of our shop. We also make our own hot fudge, caramel sauce, whipped cream, and baked goods from scratch. Are they your home-crafted recipes? Most of our recipes are Frankenstein monster amalgamations from various existing sources, tweaked and modified after a great deal of experimentation and taste testing. How many different flavors do you have? We have space for up to 16 different recipes at any given time. Some of our favorites include Mexican Chocolate ( infused with cinnamon and a kick of spice ), Chunky Cherry (cherries and chunks of chocolate), Cookies n’ Cream, and Chocolate-Covered Strawberry. Our logo is, appropriately, a tubby little robot I’ve been drawing for several years. He originally appeared on some of the error pages of websites I’ve worked on in the past. The mosaics grew out of a desire to create large-scale pixel artwork in the style of 16-bit video games – square tile mosaics seemed like a natural way to bring a digital art form into the material world. My friends and family aren’t fazed by anything at this point; most of them have been pushing for me to do something like this for years. I am absolutely nervous about starting another business and spend most nights wracked with anxiety, despite the fact that just about everything is working out quite well. From concept to opening, this has process has taken the better part of two years. What has been the most difficult part? Has it been hard to balance family life and getting the shop open? The most difficult part has been learning how to manage the build out process and all the headaches that come along with that. Balancing family life is always a challenge, but it will only get much more difficult once the shop is officially open. Fortunately I’ll be available most mornings because there aren’t many folks that buy ice cream before noon. Will you physically work in the parlor? Absolutely! I’ll be in the shop as much as humanly possible. I want to stay deeply involved in both making the ice cream and serving it. Will we see/hear advertising on tv or the radio? Not anytime soon! I would like to go as far as possible with a minimal marketing spend. I see you will have classic video games as well. What can customers look forward to playing? Donkey Kong, and Street Fighter. We originally moved to Manayunk because we loved its walkability. I built the ice cream shop here because people throughout the region are drawn to the neighborhood’s wide array of restaurants and shops. It’s also pretty great to live blocks away from work. We’re slowly looking around for some part time help, but there aren’t many positions available at this point. Why should someone come to your ice cream shop over another? Is the experience different? I personally believe that we serve up the best ice cream in Philadelphia. Beyond that, our sundaes are incredible: they allow you to pair great ice cream with interesting textures and temperatures. Our shop itself is a destination, with our custom designed interior and arcade game stations. Is the shop kid and adult friendly? Do you allow pets? We’re geared from the ground up to being family friendly. Well-behaved dogs are okay too! There’s no outdoor seating at this point, but that may change when warmer weather greets us. The wrap-around window that adjoins our internal seating, however, can be removed in its entirety to provide the experience of eating outside from within the shop. 1. Be bold; don’t allow creeping worries to unduly influence your decision-making. 2. After setting a startup budget and timeline, plan around the certainty that it will cost twice as much and take twice as long IF everything goes as planned. 3. Take your time: anything worth doing is worth doing right the first time. 5. Branding and design make the difference between a decent establishment and a blockbuster destination. Iterate until you have something you love! Chris, thank you for imparting your wisdom on us. Shoutout to our alma mater, Masterman! Ladies, and gentlemen, you heard it here first! Posted in How to, Learn Something and tagged #Masterman, #TubbyRobot, Gaming, Ice Cream, Interview, Manayunk, Philadelphia, Start a Business.